Where the DUAL PURPOSE HOUNDS excel! 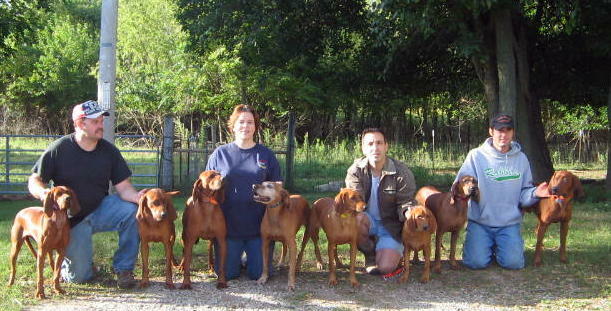 The ONLY redbone kennel to have a hound named Purina Outstanding Coonhound of the Year in HUNT (Razor in 2001) & Purina Outstanding Coonhound of the Year in SHOW (Sydney in 2008). WHERE THE DUAL PURPOSE HOUNDS EXCEL!!! Rob's passion for coonhunting began 34 years ago. He has been an avid hunter (and trapper) ever since. Together, Rob & Kat created Tree Rizin' Redbones in 1998 when we bought our first pair of redbones as a married couple. Since then, the redbone has continued to be our primary focus, but we have had excellent hounds of some of the other breeds in the past and our present as well. Our journey with these coonhounds have led us all over the country and made us many friends. Rob & I have been married for 16 Years. Together, we have five children. Courtney Michelle (who just had our first grand baby, Briele), Dakota (currently finishing up college), Cassi (currently serving our country in the US Military (and soon to give birth to our second grand baby, Madilyn Grace), Courtney Breeann (recently engaged), and our youngest (and only child together, Kadie (who will be a freshman in 2014-15). Rob works for the City of Eaton Maintenance Department, and I am an English Language Arts teacher working towards my doctorate in Curriculum & Teaching. 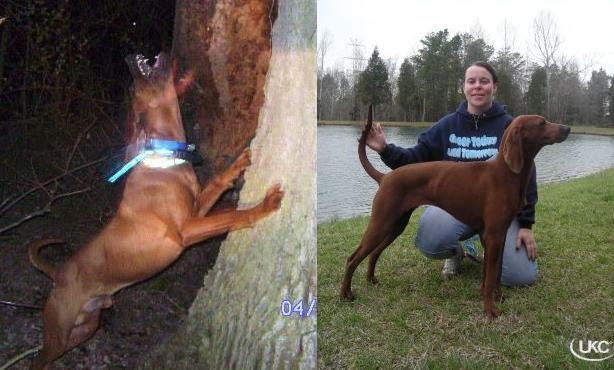 Chris & Dave (brothers) bought two redbone puppies from us out of Razor & Star about 5 years ago. Little did we know that crossing paths with the Condon's would lead to such a cherished friendship and eventual partnership. Through recent years, Chris has been instrumental in putting wins on and finishing many Tree Rizin' hounds, particularly the Razor offspring. In 2011, we invited Chris to join Team Razor officially and become part of Tree Rizin' Redbones. He's proven his loyalty and commitment to these hounds and it seemed fitting to make him a partner. In 2012, Dave jumped on board as well and is currently hunting X.
Dave & Chris are an unstoppable brother team that we are so proud to have in our corner. Never in all the years we've been running these hounds had we ever considered taking on kennel partners that would share in the Tree Rizin' legacy. Chris & Dave made that decision very easy for us. They are everything we could want in partners. The future of Tree Rizin' Redbones is stronger than ever with the addition of these two men. We are blessed to have them & are fully committed to this partnership. Check out STORM- ANVIL & BOO featured Feb 2006!! 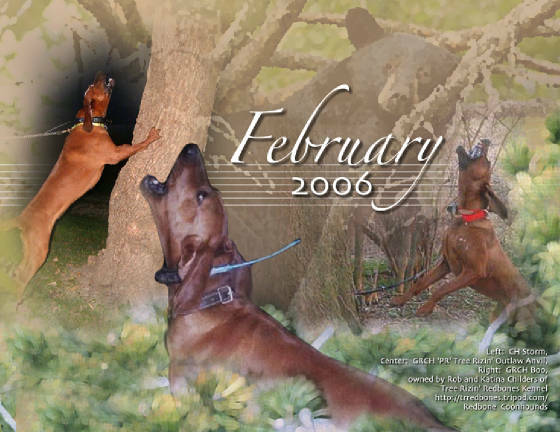 Some of the Tree Rizin' gang- past & present- featured in the NEW '05 14 mth Coonhound Calendar! WE PRAISE THE LORD FOR OUR SUCCESS!! 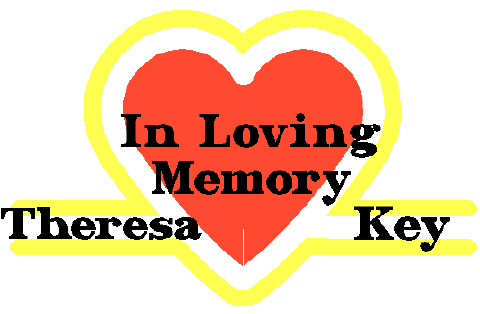 God Bless You ~ Alton & Family! !